His films have reminded us of who we are while simultaneously inspiring us to dig down deep to be better. 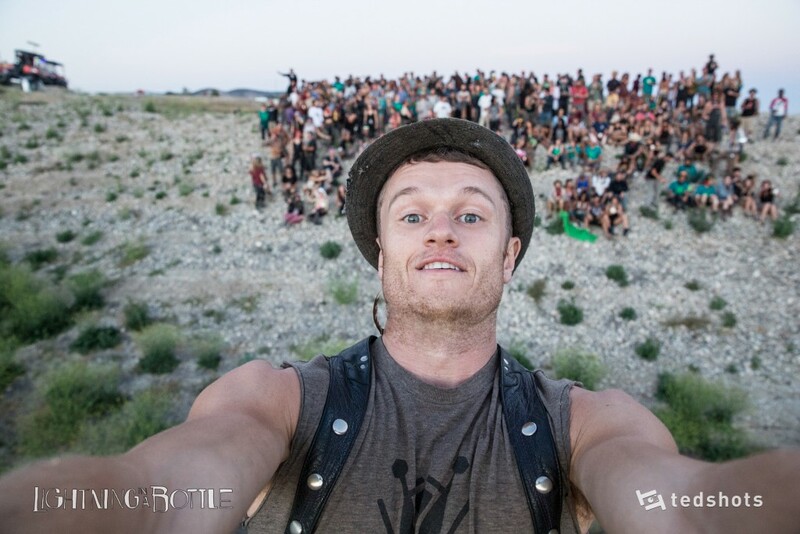 Teddy Saunders’ work at Lightning in a Bottle spans more than 5 years and in that time, he’s made a name for himself as a preeminent artist, an accomplished videographer and a captivating storyteller. In 2011, Saunders made The Faces of Lightning in a Bottle a raw and beautiful film showcasing the smiling faces and decorative costumes of guests at Lightning in a Bottle. Then, in 2012, Saunders made When I Grow Up, a story about staying young at heart with a cast entirely comprised of festival guests of all ages at Lightning in a Bottle. In that same year, Saunders released Oh, the Places You’ll Go at Burning Man, a film that garnered more than 3 million views on YouTube, acclaim from the online Burner community and international groundswell across the social mediascape. In his most recent work, Magic Moments, he takes us on a journey that transcends the cubicle contained mediocrity of life that many struggle with and spirits us away into the ecstasy of art and music festivals through poetry. The film is shot on-site at Lake San Antonio, California during Lightning in a Bottle 2015. In an announcement to his friends and colleagues on facebook Saunders told the story of capturing that transformative essence that seems to permeate festivals and the medicine that creative work became in the time when he needed it most. Here’s what Teddy Saunders had to say about working on the project. I am pleased to present my latest film: Magic Moments. Allow me to explain the interesting backstory behind this film. I had written the script in 2012 about the specific moments that might cause someone to “transform” at a music festival. This was a challenge because everyone has their own perspective and experiences that create “transformative realizations” unique to them. Coachella was interested in me shooting the film there in 2012, but I held off on making it until 2015 when the Do Lab liked the idea of shooting it at LIB. So here’s the irony: The words in this film was the medicine that I needed to get out of my rut. This film explains that we should go on adventures with friends, be ok with being independent, be colorful, be weird, meet new people and trust that you have the support of the amazing friends around you. Before shooting the film I didn’t believe the truth of its message, and then by the time I had finished, it reminded me how true its message was. As I was shooting this film, it also felt exactly like I was back at Burning Man shooting “Oh the Places” and I knew that there was something special here. I am grateful that I have the opportunity to inspire others through passion projects like this and I do hope to have “transformative” connections with all of you at LIB this year. Thank you for supporting me as an artist. Let’s change the world together.